* Greek Wars. Encyclopaedia "The Helios". * Ziemke, Balkan Campaigns 互联网档案馆的存檔，存档日期2009-02-08. * Long (1953), 182–183 互联网档案馆的存檔，存档日期2008-02-28. ^ Greek Wars. Encyclopaedia "The Helios". * Hitler, Speech to the Reichstag on May 4, 1941 互联网档案馆的存檔，存档日期2008年4月13日，. ^ Greece, History of. Encyclopaedia "The Helios". * Greece, History of. Encyclopaedia "The Helios". ^ 33.0 33.1 George II. Encyclopedia "The Helios". ^ Greece, History of. Encyclopaedia The Helios. ^ Ziemke, Balkan Campaigns 互联网档案馆的存檔，存档日期2009-02-08. * Long (1953), 96 互联网档案馆的存檔，存档日期2008-02-28. ^ Long (1953), 96 互联网档案馆的存檔，存档日期2008-02-28. ^ Long (1953), 96–97 互联网档案馆的存檔，存档日期2008-02-28. ^ Long (1953), 98–99 互联网档案馆的存檔，存档日期2008-02-28. ^ Long (1953), 95 互联网档案馆的存檔，存档日期2008-02-28. * Brallos Pass. The Encyclopaedia of Australia's Battles. ^ Menzies, 1941 Diary 互联网档案馆的存檔，存档日期2006-09-09. ^ Long (1953), 104–105 互联网档案馆的存檔，存档日期2008-02-28. ^ Long (1953), 112 互联网档案馆的存檔，存档日期2008-02-28. * Greece (World War II). An Encyclopedia of Battles. ^ Crete, Battle of. Encyclopaedia "The Helios". * George II. Encyclopaedia "The Helios". ^ Greece (World War II). An Encyclopedia of Battles. ^ Hitler, Speech to the Reichstag on May 4, 1941 互联网档案馆的存檔，存档日期2008年4月13日，. ^ Long (1953), 182–183 互联网档案馆的存檔，存档日期2008-02-28. Air Marshal Sir John D'Albiac. Air of Authority - A History of RAF Organisation. [2007-03-31]. 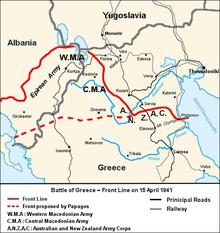 Balkan Operations – Order of Battle – W-Force – 5th April 1941. Orders of Battle. [2007-03-31]. （原始内容存档于2007-10-07）. Bailey, Robert H. Partisans and Guerrillas (World War II). Time Life UK. 1979. ISBN 0-8094-2490-8. Barrass, M.B. Air Marshal Sir John D'Albiac. Air of Authority - A History of RAF Organisation. [2007-03-31]. Beevor, Antony. Crete: The Battle and the Resistance. Westview Press; Reissue edition. 1994. ISBN 0-813-32080-1. Bitzes, John. Greece in World War II: To April 1941. Sunflower University Press. 1989. ISBN 0-89745-093-0. Bosworth, R.J.B. Mussolini. A Hodder Arnold Publication. 2002. ISBN 0-340-73144-3. Brallos Pass. The Encyclopaedia of Australia's Battles. Allen & Unwin. 2001. ISBN 1-865-08634-7. Broad, Charlie Lewis. Winston Churchill: A Biography. Hawthorn Books. 1958. Buckley, Christopher. Greece and Crete 1941. P. Efstathiadis & Sons S.A. 1984. Campaign in Greece. The Encyclopedia Americana. Grolier. 2000. ISBN 0717201333. Celebration of Greek Armed Forces in Washington - Remarks by Secretary for Veteran Affairs, Mr Jim Nicholson. Press Office of the Embassy of Greece. 2006-11-24 [2007-05-24]. （原始内容存档于2007-09-27）. Churchill, Sir Winston. Robert Rhodes James, 编. His Complete Speeches, 1897–1963. Chelsea House Publishers. 1974. ISBN 0-835-20693-9. Churchill, Sir Winston. Yugoslavia and Greece. Memoirs of the Second World War. Houghton Mifflin Books. 1991. ISBN 0-395-59968-7. Ciano, Galeazzo. The Ciano Diaries 1939–1943. Doubleday & Company. 1946. ASIN B000IVT93U. Collier, Richard. Duce!. Viking Adult. 1971. ISBN 0-670-28603-6. Crete, Battle of. Encyclopaedia "The Helios". 1952. Ėrlikhman, Vadim. The Ciano Diaries 1939–1943. Doubleday & Company. 1946. ASIN B000IVT93U. Creveld, Martin van. In the Shadow of Barbarossa: Germany and Albania, January-March 1941 7 (3/4): 22–230. July–October 1972 [2007-09-12]. Duncan, George. 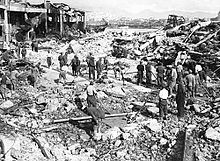 More Maritime Disasters of World War II. Historical Facts of World War II. [2007-09-14]. （原始内容存档于2007年9月1日）. Eggenberger, David. Greece (World War II). An Encyclopedia of Battles. Courier Dover Publications. 1985. ISBN 0-486-24913-1. Events Marking the Anniversary of the Liberation of the City of Athens from Occupation Troops. News in English, 00-10-12. The Hellenic Radio (ERA). [2007-04-23]. Goebbels, Joseph. Diaries, 1939–41 (translated by Fred Taylor). Hamish Hamilton Ltd. 1982. ISBN 0-241-10893-4. George II. Encyclopaedia "The Helios". 1952 （希腊语）. Goldstein, Erik. Second World War 1939–1945. Wars and Peace Treaties. Routledge. 1992. ISBN 0-415-07822-9. Greece, History of. Encyclopedia "The Helios". 1952. Greek Wars. Encyclopedia "The Helios". 1952. Hondros, John. Occupation and Resistance: The Greek Agony 1941–44. Pella Pub Co. 1983. ISBN 0-918618-19-3. Jerasimof Vatikiotis, Panayiotis. Metaxas Becomes Prime Minister. Popular Autocracy in Greece, 1936–41: a Political Biography of General Ioannis Metaxas. Routledge. 1998. ISBN 0-714-64869-8. Keegan, John. The Second World War. Penguin (Non-Classics); Reprint edition. 2005. ISBN 0-14-303573-8. Keitel, Wilhelm. Prelude to the Attack on Russia, 1940–1941. (编) Walter Görlitz. In the Service of the Reich (translated by David Irving). Focal Poiny. 1965. Kirchubel, Robert. Opposing Plans. Operation Barbarossa 1941 (2): Army Group North. Osprey Publishing. 2005. ISBN 1-841-76857-X. Lawlor, Sheila. Churchill and the Politics of War, 1940–1941. Cambridge University Press. 1994. ISBN 0-521-46685-7. Lee, Stephen J. Dictatorship in Italy. European Dictatorships, 1918–1945. Routledge. 2000. ISBN 0-415-23045-4. Long, Gavin. The German Attack Opens. Volume II – Greece, Crete and Syria. Australia in the War of 1939–1945. Canberra: Australian War Memorial. 1953. Macdougall, A.K. Australians ar War A Pictorial History. The Five Mile Press. 2004. ISBN 1-86503-865-2. McClymont, W.G. Chapters 6 - 22. To Greece. Part of: The Official History of New Zealand in the Second World War 1939–1945. Wellington: Historical Publications Branch. 1959. Menzies, Robert. The Greek campaign. Menzies' 1941 Diary. Old Parliament House, Canberra. [2006-09-12]. （原始内容存档于2006-09-09）. More U-boat Aces Hunted down (Sunday, March 16, 1941). Chronology of World War II. OnWar.Com. [2006-10-06]. Neville, Peter. The Slide to Disaster. Mussolini. Routledge. 2003. ISBN 0-415-24989-9. Papagos, Alexandros. The Battle of Greece 1940–1941. Athens: J. M. Scazikis Alpha. 1949 （希腊语）. Pelt, Mogens. Tobacco, Arms and Politics: Greece and Germany from World Crisis to World War, 1929–1941. Museum Tusculanum Press. 1998. ISBN 8-772-89450-4. Richter, Heinz A. Greece in World War II (translated from the German original by Kostas Sarropoulos). Athens: Govostis. 1998. ISBN 9-602-70789-5 （希腊语）. Rodogno, Davide. Italo-German Relations in Mediterrenean Europe. Fascism's European Empire: Italian Occupation During the Second World War translated by Adrian Belton. Cambridge University Press. 2006. ISBN 0-521-84515-7. The Roof is Leaking. Australia's Wars 1939–1945. Australian Department of Veterans' Affairs. [2006-10-09]. Roosevelt, Franklin D. President Roosevelt to King George of Greece, December 5, 1940. Peace and War: United States Foreign Policy, 1931–1941. [2007-08-01]. Titterton, G.A. British Evacuate Greece. The Royal Navy and the Mediterranean. Routledge. 2002. ISBN 0-714-65205-9. Vick, Alan. The German Airborne Assault on Greece. Snakes in the Eagle's Nest: A History of Ground Attacks on Air Bases. Rand Corporation. 1995. ISBN 0-833-01629-6. Ziemke, Earl F. Balkan Campaigns. World War II Commemoration. [2007-04-04]. （原始内容存档于2009-02-08）. Bevin, Alexander. How Hitler Could Have Won World War II: The Fatal Errors That Led to Nazi Defeat. Three Rivers Press; Reprint edition. 2001. ISBN 0-609-80844-3. Carlton, Eric. Selective Control: Nazi non-Eastern Occupation Policies. Occupation: The Policies and Practices of Military Conquerors. Routledge. 1992. ISBN 0-415-05846-5. Cervi, Mario. The Hollow Legions. Chatto and Windus London. 1972. ISBN 0-7011-1351-0. Hellenic Army General Staff. An Abridged History of the Greek-Italian and Greek-German War. Athens: Army History Directorate Editions. 1997. OCLC 45409635. Lannoy, Francois de. Operation Marita-April 1941: La Guerre dans les Balkans. Editions Heimdal. 2001. ISBN 2-840-48124-3 （法语）. Mazower, Mark. Inside Hitler's Greece: The Experience of Occupation, 1941–44. Yale University Press. 2001. ISBN 0-300-08923-6. Playfair, Major General I.S.O. The Mediterranean and Middle East Volume II: The Germans come to the help of their Ally (1941). 1956. Rigopoulos, Rigas. Secret War: Greece-Middle East 1940–1945: The Events Surrounding the Story of Service 5-16-5. Turner Publishing Company. 2003. ISBN 1-56311-886-6. Shores, Christopher. Air War for Yugoslavia, Greece, and Crete 1940–1941. Grub Street. 1992. ISBN 0-948817-07-0. Stassinopoulos, Costas. AModern Greeks: Greece in World War II: The German Occupation and National Resistance and Civil War. American Hellenic Institute Foundation, Inc. 2005. ISBN 1-889247-01-4. Willingham, Mathew. Perilous Commitments: The Battle for Greece and Crete 1940–1941. Spellmount Publishers. 2005. ISBN 1-86227-236-0. Zotos, Stephanos. Greece:The Struggle For Freedom. Thomas Crowell Company. 1967. ASIN B0006BRA38. Horlington, E. Brotherhood of veterans of the greek Campaign. WW2 People's War. BBC. [2007-09-12]. Judgement : The Aggression Against Yugoslavia and Greece. The Avalon Project at Yale Law School. [2007-09-12]. （原始内容存档于2007-10-13）. The Greek Campaign. Prisoners of War. [2007-09-12]. （原始内容存档于2012-03-06）. The Greek Campaign, 1941. Australian War Memorial. [2007-09-12]. （原始内容存档于2007-06-06）. The Invasion and Battle for Greece (Operation Marita). Feldgrau.com - Research on the German Armed Forces 1918–1945. [2007-09-12]. The Invasion of the Balkans: Yugoslavia, Greece and Crete, 1940–1941. Democracy at War: Canadian Newspapers and the Second World War. War Museum. [2007-09-12]. （原始内容存档于2004-07-26）. Watt, Jock. Greek Campaign 1940–41. WW2 People's War. BBC. [2007-09-12].